THE NEW FIDELITY CARD IS FREE! You can renew your mooring or to benefit from the harbor services thanks to the collection of points. 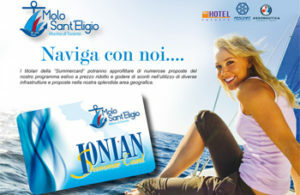 You can collect the points, experiencing the life of “Molo Sant’Eligio” in an actively way or enjoying the services. GOLDEN CARD. You can renew your mooring or to benefit from the harbor services thanks to the collection of points. 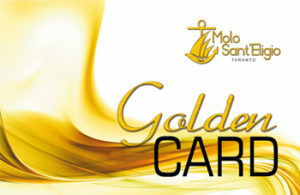 You can collect the points, experiencing the life of “Molo Sant’Eligio” in an actively way or enjoying the services. Few and simple rules: Your spending will be saved to accumulate points if you carry up different activities, such as: introducing us a new client, renewing your mooring agreement, making the maintenance of your boat and booking parties and buffet in Alessandro yacht bar/club. The Summercard’ s owners can benefit from our summer offers at a reduced price and they can profit it, using our offers and facilities in this amazing geographical area. – Food and wine tasting in masseria ( a farm), an extrasensory experience in the peace of the old masseria of the Salento, with the tasting of traditional products, wine, extra- virgin olive oil, dairy products and local dishes. – Agreement with the exclusive Relais Histo San Pietro on Mar Piccolo, with its amazing spa and wellness area.